DIRECTIONS: Make sure hoof is thoroughly CLEAN and DRY. Pack in around frog. Spread layer over sole and cover with paper. Apply two or three times a week. For easier application in cold weather, keep where warm. How to pack a hoof: 1. Make sure hoof is clean and dry. Take a small amount of Forshner's (about the size of a golfball) and work in your hands until pliable. 2. Pack firmly around the frog. 3. Continue to cover sole of hoof completely. (Cover with paper or straw if needed. *) 4. Remove with hoofpick before working horse. *Farriers: follow above directions and cover with pad before shoeing. 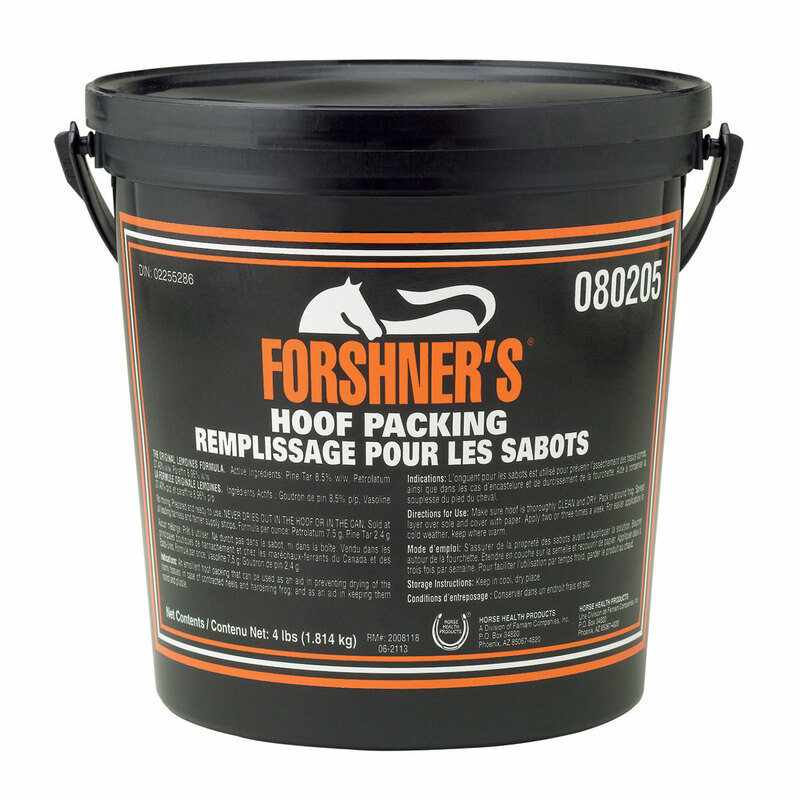 Forshner's Hoof Packing is rated 4.7 out of 5 by 6. Rated 5 out of 5 by RaRa1345 from Love this stuff I've been using this stuff for awhile now, got it for my old horse that had horrible sensitive feet and continue to use it on my current show jumper after a lot of impact. Told my farrier I was using it and his response was "that stuff is great!" I was glad it had his approval as he's one of the best. Rated 5 out of 5 by Rara123 from Love this stuff I've been using this over the other brands forever. I use this to pack my horses feet at horse shows and I think it works just amazing. When I told my farrier that is what I was using he told me he wouldn't use anything else. Rated 5 out of 5 by Anna from Great for the price. Typically we use Magic Cushion, but when traveling around the country to multiple horse shows, our bucket of Forshner's has been perfect. It is great for when the footing is a little hard or we're spending a lot of time on concrete or gravel. Definitely makes a big difference at a better price than Magic Cushion! Rated 5 out of 5 by OutHorsinAround from Awesome Product! This product was highly recommended by my farrier. After using this product I saw a dramatic improvement in the contracted heels of my horse. I use this product in conjunction with SmartSox and SmartHoofUltra.